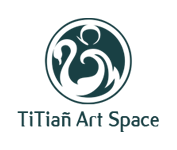 I Made Sujendra (b. 1964) is the son of the accomplished painter, I Wayan Kabetan, from whom he first learned the traditional techniques of Batuan painting. Rather than drawing finesses, he focuses on unique interpretations of Balinese legends, folklores and stories. In the mid 1980s he produced perhaps the first Batuan surrealist painting, but abandoned this style due to lack of commercial interest. Two components appear in virtually all of Sujendra’s works: the life source, the sun shining blue light to all creatures and beings and the red squiggle lines, scattered on the canvas, that represent the evil tendency in us all. He explores the conflict and struggle between these two forces by visualizing them using the tantric stories, Balinese legends and folklores. 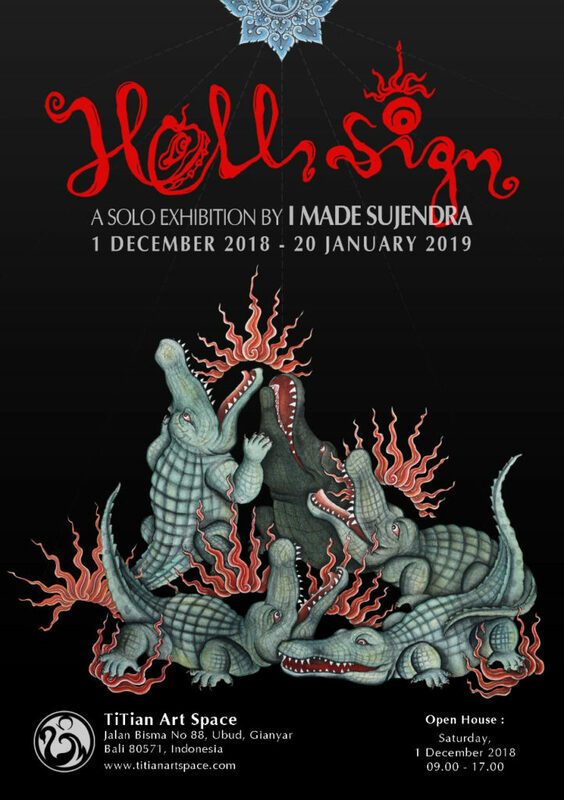 In this exhibition, entitled “Hell Sign”, Sujendra offers us various views of the punishments and rewards in the after life. The major religions promise horrific punishments in the after life as a deterrent to our acting on our evil tendencies. Rather than focusing on punishment, Sujendra considers the afterlife as the natural consequences of our choices in living our life. It is about choice rather than punishment! The concept of Tri Hita Karana governs the life of Hindu believers and is understood as maintaining the balance between human – earth – God. As such, hunters will be haunted in the after life by animals and creatures they hunted; and the guardians of the Hell will split open the head of forest loggers with a large saw. Likewise, Sujendra offers visual language for the consequences of five other vices: infidelity, laziness, neglecting family and community, aborting life and running from gender role and responsibility. The ultimate consequences is being reborn – reincarnation – as a process of purification of our soul until such time as it returns to its pure state.